What is OpenFSI and how can it be used? OpenFSI is the MSC Nastran SDK base architecture to build your own interface to any fluid-type loading of the structural mesh. It enables existing coupling to CFD codes via MpCCI code coupler, or specific CFD vendors who have built an interface to it. Alternatively it can be used to connect to custom user loading, such as a formula or look-up table. Essentially it is a user subroutine for loading, but which was specifically tailored around fluid loading applications. An example is shown below that highlights the added insight that a fluid-structure interaction analysis can give the engineer. The simplified vehicle shape and CFD domain can be seen in the video below. The airflow is accelerated from 0 to 100km/h in 4 seconds and then from 100 to 200km/h the remaining 6 seconds, for a total duration of 10 seconds. The structural analysis part consisted only of the rear spoiler and flexible attachment, with appropriate boundary conditions (rotations free, but translation fixed). The interaction surface between the FEA and CFD side was identified as the outer skin of the rear spoiler itself. Looking closer at the rear spoiler, the interaction between the airflow and deformation/displacement of the spoiler can be clearly seen. 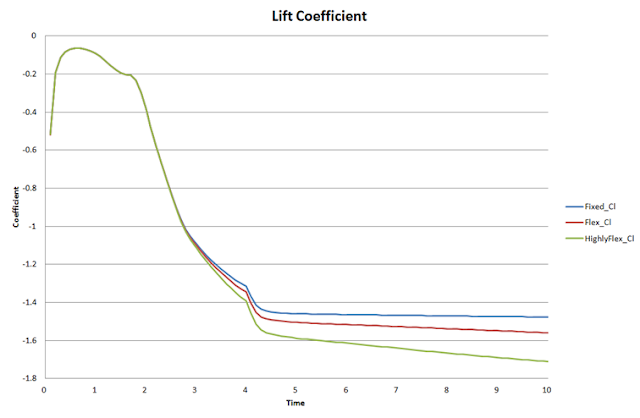 The effect of this flexibility provided an interesting comparison between a fixed spoiler, one that is slightly flexible and the result above that is highly flexible. 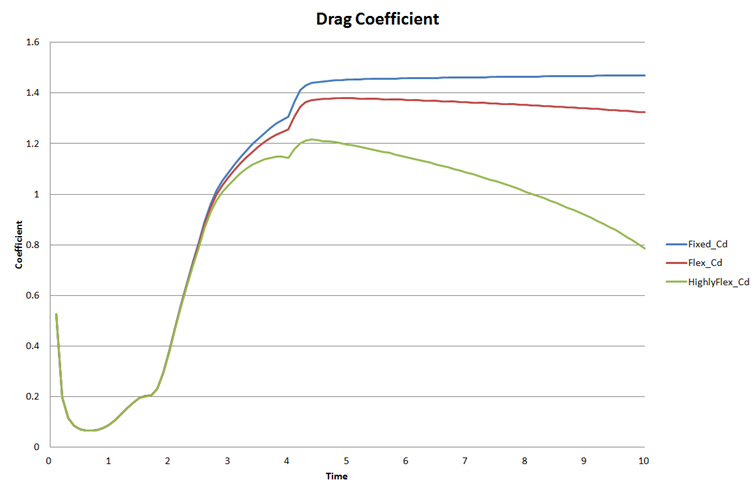 For both the drag and lift coefficient, the highly flex spoiler seems to be performing ideally, as the drag is lowered, while the downforce increases as the vehicle velocity increases. It is best to set up your own build environment and then create your custom services there as well to point Nastran to use these services. The Apps directory has all the compiled libraries (.dll) and service name lists to use in the Nastran input. Now your environment is all good to go and you can start building your own code to run automatically with MSC Nastran. The benefit of this setup is that by just replacing the build_root\src with other source codes and building again, each build libraries are added to the build_root\Apps and appended to the SCAServiceCatalog.xml catalogue. Therefore multiple services can be created and stored in a single environment with just the Nastran input file pointing to the appropriate service to use. echo "**** NASTRAN SDK ENVIRONMENT ****"
echo " do in src dir"
echo " copy idl file from \solver\sdk\idl\SCA\MDSolver\..."
echo " copy sdl file from \solver\nast\services\Implementations\..."
echo " do in home dir"
This must then be launched from the build_root\ directory and will compile and build the dll libraries and service catalogs etc as shown above. Some runtime c++ errors might occur, but can be ignored. So this is pretty much the business end of the code. Furthermore, the spatial location of the nodes can be identified (wettedNodeCoordinates) and used as input to loading calculation. At the end of the step, the resulting displacement (wettedNodeDisplacements) and velocities (wettedNodeVelocities) can be retrieved and passed on so that this can be used for CFD mesh updates etc. An example with a Nastran demo of a flat plate with the example OpenFSI load of a sinusoidal load can be downloaded below - it uses the example code that needs to be built as shown above. In all OpenFSI analyses, it is important to output Nastran Applied loads to see the fluid loading as generated by the code.